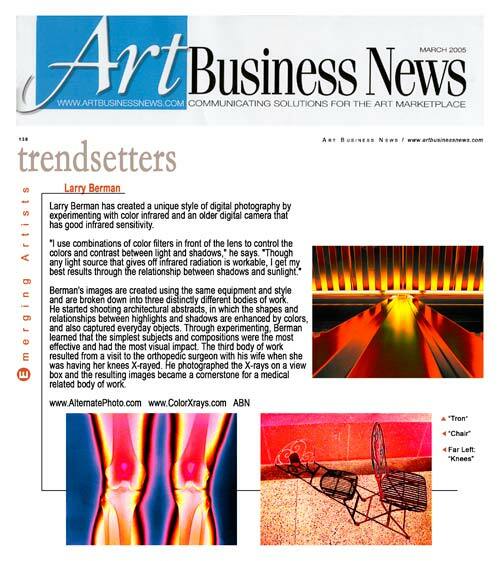 Larry Berman has created a unique style of digital photography by experimenting with color infrared and an older digital camera that had good infrared sensitivity. "I use combinations of color filters in front of the lens to control the colors and contrast between light and shadows," he says. "Though any light source that gives off infrared radiation is workable, I get my best results through the relationship between shadows and sunlight." Berman's images are created using the same equipment and style and are broken down into three distinctly different bodies of work. He started shooting architectural abstracts, in which the shapes and relationships between highlights and shadows are enhanced by colors, and also captured everyday objects. Through experimenting, Berman learned that the simplest subjects and compositions were the most effective and had the most visual impact. The third body of work resulted from a visit to the orthopedic surgeon with his wife when she was having her knees X-rayed. He photographed the X-rays on a view box and the resulting images became a cornerstone for a medical-related body of work.